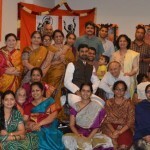 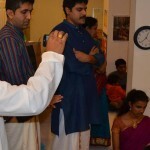 With boundless grace of Sri Swamiji, Sri Ramanujamji conducted Srimath Bagavatha Saptaham at Germantown, Maryland from 3October 30th to November 5th 2015. 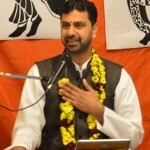 Sri Ramanujamji started off with an emphasis on Srimad Bhagavtham’s glory and summarized the essence of each and every canto to explain how Srimad Bhagavatham remains the supreme Thilaka among all Purana’s. 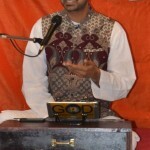 He highlighted upon “Shravana Bakthi” and beautifully expounded the relevance of Bhagavatha Dharma in this Age of Kali. 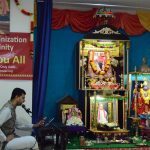 He further went on to highlight how Bhagavata Dharma can transcend one’s mundane desires into blossoming of ecstatic love for lotus feet of Krishna. 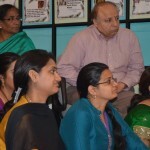 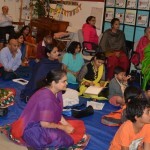 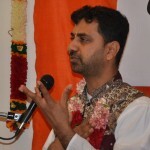 Devotees were enthralled to listen in detail about Kunti Stuti, Bheeshma Stuti, Suka-Parikshit Samvadha, Charitra’s of various baktha’s like Dhruva, Prahaladha , Ajamela, Gajendra, Vridasura, Jada Bharata and Ambaresha. 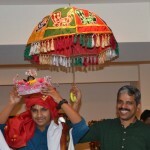 Listeners were transported to the holy land of Brindavana on last two days – as it was filled with sweetest Krishna Katha starting with Jananam, Damodhara Leela, Navaneetha Chora leela, Brahma Mohana Leela , Kalinga Nardhana, Govardhana Leela, Raas Leela and auspiciously culminating with Rukmini Vivah. 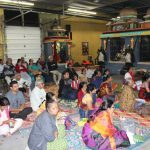 Pravachan was very well received and enjoyed by the entire audience, most of whom were first timers to Srimad Bhagavatha Saptaham. 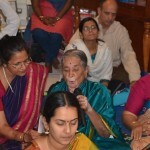 Everybody felt blessed and indebted at the lotus feet of Sri Swamiji, whose causeless Grace has bestowed the devotees with the rarest fortune of listening to “Srimad Bhagavatham” from Sri Ramuanujamji whose versatile elucidation was relished alike to a layman as it is to a learned pandit. 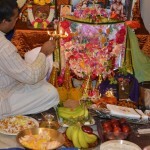 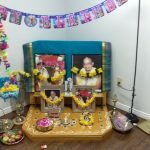 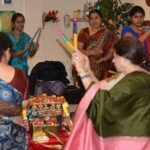 Radha Kalyanam was celebrated on Sunday, November 1st 2015. 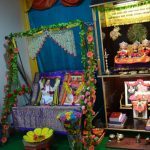 Devotees started with Sampradhaya Bajans, Thodaya Mangalam, Ashtapathi’s on October 30th 2015 and culminated it with Kalyana Ashtapathi Tharangam to celebrate the divine wedding of “Radha Kalyana Yugalam”. 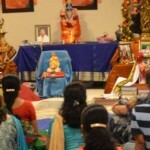 Daily morning, devotees did parayanam of Srimath Bagavatham’s Dasama Skanda (Poorvartha). 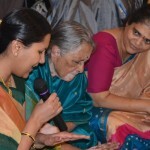 Sri Ramanujamji expounded on the important chapters during Parayanam which devotees truly relished upon. 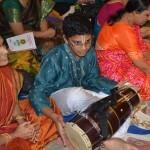 In the evenings, Satsang kids offered their service by rendering slokas and songs. 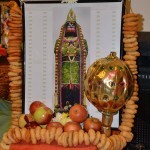 On all days Dinner Prasad was served to all devotees. 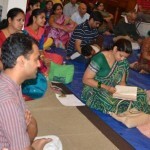 About 40-50 devotees participated in Katha Sharavanam through 7 days. 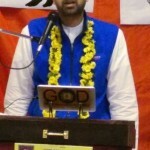 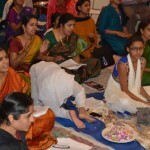 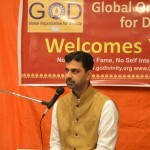 Virginia GOD Satsang families felt blessed with the God-given opportunity to take up Guru Kainkarya for this Saptaham and be of service to Sri Swamiji. 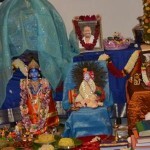 Devotees are eagerly waiting for next Saptaham from Sri Ramanujamji.